After dropping my stuff in the locker room I nervously entered the spin room and chose a bike towards the back (I’m fairly tall and don’t like feeling that I’m blocking someone else’s view). My bike neighbours were nice and gave me tips about how to position my feet and knees to avoid injury, Casey helped me set my bike seat and handles to the right height, and I was ready to spin! Now I definitely wasn’t doing as tough of a workout as others in my class. My goal was simply to make it through the whole class consistently spinning with no breaks. What was great is that everyone was able to choose what was and wasn’t right for them. If there’s too much resistance you can turn it down, if you’re not ready for the next out of saddle lift that’s okay. I did some but not all of the lifts and barely touched my resistance knob. Even when taking it easy my body was getting the best workout it had had in a long while. What surprised me is how motivated I was to keep pedalling. The room was filled with positive motivation as everyone pedalled together while Casey and her seemingly endless energy and positivity helped motivate us to keep going. Although pedalling a stationary bike indoors sounds monotonous, doing it in a room full of motivated energized people with great music playing is very powerful. We were all in it together. On my way home after the class, I didn’t feel the exhaustion I expected, I felt accomplished. I felt excited that I had finished my first spinning class, peddling the whole way through. I was also proud that I had tried something new, as I often get into workout ruts of doing the same thing over and over again. Now, a whole new kind of fitness was a part of my life and it was still Saturday morning, a day I normally take easy. I felt I had already accomplished something and was ready to do more. The following day my legs were sore; every time I stood up or went up or down stairs my legs ached. But this was a good ache, it was an ache saying I’d challenged my body and that my body had met that challenge. The ache didn’t limit my day as I still went for a walk with friends and out to lunch, rather it served as a reminder of yesterday’s achievement. And now that the aches are gone I’m looking forward to my next class where I’ll challenge my body a little more. 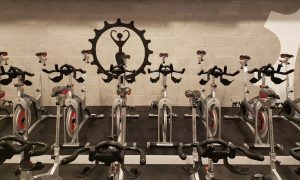 This entry was posted in indoor cycling, toronto studio. Bookmark the permalink.